How about a FREE fun family holiday movie night on us?! We’re sharing an awesome prize pack giveaway to help you have a great Christmas movie night! We LOVE Christmas movies and doing family movie nights around the holiday – especially with the glow of the light from the Christmas tree! SO nice! In fact, we have a whole large Christmas basket, full of our favorite holiday movies! We pull it out every year the day after Thanksgiving! So fun! This year, we’re excited to add Santa’s Apprentice and The Magic Snowflake to our collection with a special DVD double feature (thanks to sponsor Anchor Bay Entertainment). 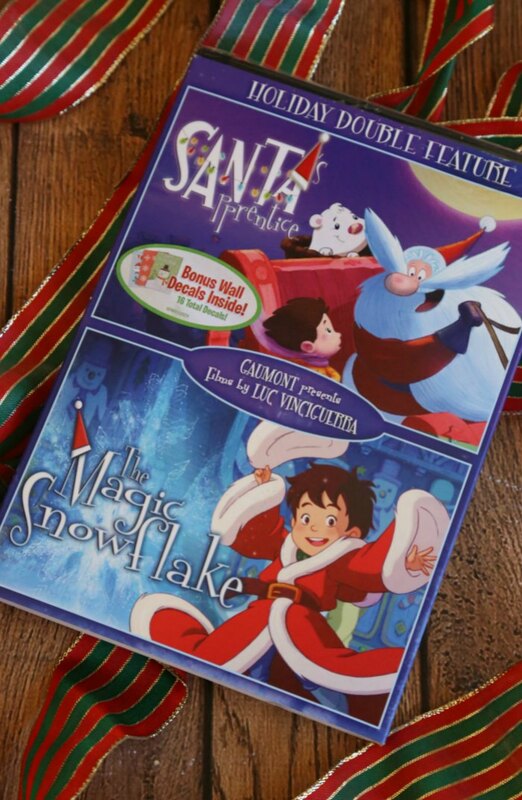 These seem like the perfect animated tales filled with holiday magic for the whole family – great for holiday gift giving! Plus, the set features 16 festive holiday decals in-pack to help bring some extra holiday cheer! These films are available on DVD, Digital HD and On Demand, and special DVD double feature. You can find out where you can purchase your copy on Go Watch It! So…how would you like to WIN a copy, along with a $50 gift card to fund your family movie night? 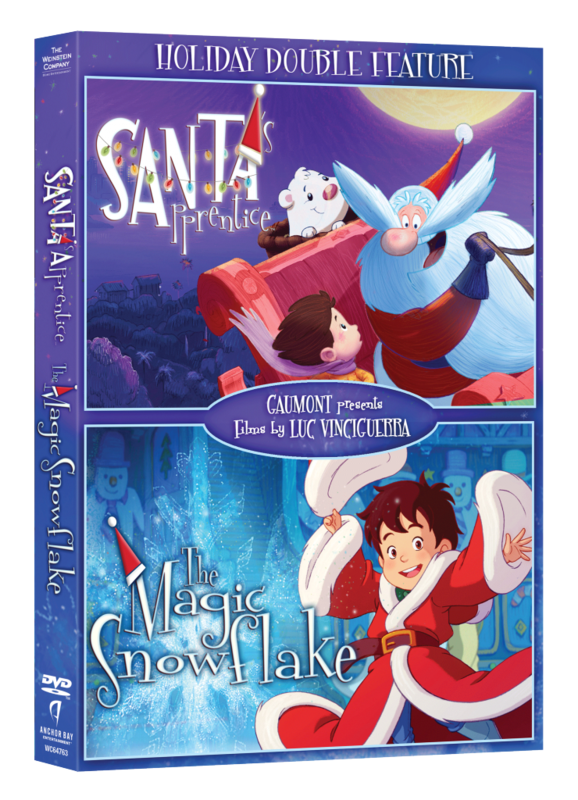 Santa’s Apprentice and The Magic Snowflake Holiday Movie Night Giveaway!!! $50 Visa Gift Card to plan a family movie night! Enter using the form below! Good luck and Merry Christmas! I like Christmas with the Kranks. My favorite is Christmas Vacation with Chevy Chase! So funny! My favorite Christmas movie is Miracle on 34th Street. The original with Natalie Wood. Our longtime fave Christmas movie is How the Grinch stole Christmas with Jim Carrey! We are always cracking up at Jim! My favorite Christmas movie is Miracle on 34th Street. My favorite Xmas movie is White Christmas! My all time favorite Christmas movie is National Lampoon’s Christmas Vacation. I like Chevy Chase’s Christmas Vacation. My all time favorite Christmas movie is A Christmas carol. My favorite is Santa vs Snowman. Oh I have to say my personal favorite is Deck The Halls! So funny! I have to watch every year. Our little one…his favorite is A Charlie Brown Christmas! We love watching Christmas movies! My favorite is The Grinch that Stole Christmas. I still love the Rudolph movies. When I am in the mood to laugh I will watch Ernest saves Christmas. Yeah I am a little weird and so is my humor but that movie is so funny. My favorite Christmas movie hands down is Christmas Vacation we watch it every single year. I like The Grinch and A Christmas Story. My favorite Christmas Movie is The Night Before Christmas. I like the Grinch. Every year I look forward to watching this movie during the holidays. A mom for Christmas has always been my favorite. My favorite is Home Alone. My favorite of all time is ELF!! As a granny, my favorite Christmas movie is “It’s a wonderful life”. But we love enjoying animated holiday movies like this one of the “Santa’s Apprentice and The Magic Snowflake” with our grandson when he stays over and that way me and his papaw get to be like kids again while seeing the laughter and joy in his eyes as we enjoy the movies together. This one sounds so fun to enjoy during the holidays on winter break, thank you and Happy Holidays to you and your family too. My favorite Christmas movie is The Dog Who Saved Christmas. My favorite Christmas movie is The Grinch. I love to watch it with my kids this time of the year. I have always love the Home Alone movies during Christmas as a child and as an adult. We love Home alone and Elf! My favorite Christmas movies are Christmas in Connecticut and Home Alone. Such classics! My favorite Christmas movie is Home Alone, the original one. My favorite is Eloise at Christmastime. My favorite Christmas movie is The Christmas Story. MY FAVORITE MOVIE IS ELF! We love so many of them! The Santa Claus Series is one of our favs!